There is no shortage of surprises in the world of oil. Nobody anticipated the rush of oil supplies that would come online in such a short time from US shale over the last few years. The unexpected surge in supplies led to the crash in prices. Let’s take a look a few recent incidents. In the Gulf of Mexico an oil platform was forced to shut down on May 22 after a piece of equipment caught fire. 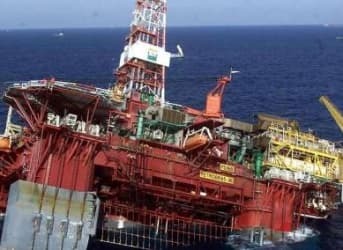 The platform was small, producing only 2,200 barrels per day, but 28 workers had to be evacuated and brought to shore. Another safety incident occurred a few days earlier when Plains All American pipeline ruptured in Santa Barbara, spilling oil into the Pacific Ocean. The oil marred the coastline and harmed wildlife. While not an upstream project, the flow of 50,000 barrels per day through the pipeline will be offline until it is fixed. In Libya, the eastern government recognized by the international community conducted an airstrike on a fuel tanker sitting just off the coast. The tanker was preparing to unload its 30,000 metric tons of fuel for a power plant, but the eastern government may have thought the tanker was being used to carry rival militants. The tanker caught fire, but fortunately was extinguished. In Nigeria, the surprise supply event has been downstream. A strike by oil-tanker drivers has led to shortages of refined products. Gas stations have closed, traffic is reportedly down, flights have been cancelled, and businesses have been negatively impacted. A shortage in fuel supplies is worsening by the day. In Canada, forest fires have put oil sands operations in their crosshairs. Cenovus Energy Inc. was forced to shut down a site that produces 130,000 barrels per day as the fires moved in. A few other companies nearby also took its operations offline. The fires have cut off 9 percent of Canada’s oil sands. The examples above are just incidents that took place in May, and is likely not comprehensive. Since 2013, the world has routinely seen roughly 3 million barrels per day offline at any given time due to unexpected circumstances. In the past, before the US ramped up oil production in dramatic fashion, prices would spike from geopolitical tension, often adding a few dollars onto a barrel of oil. Prices would even spike before actual production was lost, with a risk premium added just because there was a possibility that oil would be knocked offline. For now, these geopolitical events are not having much of an effect, due to the supply overhang. But it is important for oil market watchers to keep in mind that these supply disruptions have not gone away and are still occurring with an alarming frequency. If and when oil markets rebalance, any one of the examples listed above could cause prices to jump.